A brief interview with the Syrian Ambassador to the UN Dr Bashar al-Ja’afari. With the breakdown of the US-Russia brokered the cessation of hostilities in Syria we are now being bombarded with claims and counter claims of who was responsible. There is also a propaganda barrage coming from the US and its allies suggesting to me they are more concerned about the impending defeat of the “rebels”/”terrorists’ in east Aleppo than they are with humanitarian suffering. Dr Bashar al-Ja’afari impresses me with the clear and concise arguments he makes. It is a pity he is not given the coverage on our main stream media that his position should demand. He makes a lot more sense than the US Ambassador to the UN, Samantha Power. Victory over terrorism in Syria is still a long way off. But the liberation of Palmyra was an important and symbolic step towards that. This concert on Thursday, in the historic amphitheatre of the ancient city of Palmyra, was dedicated to the 71st anniversary of the defeat of fascism in Europe as well as an expression of gratitude to all those who fight terrorism today and memorial to the victims of terrorism. “A placard hanging from the waist of his dead body listed al-Asaad’s alleged crimes: being an “apostate”, representing Syria at “infidel conferences”, serving as “the director of idolatry” in Palmyra, visiting “Heretic Iran” and communicating with a brother in the Syrian security services. His body was reportedly displayed in the new section of Palmyra (Tadmur) and then in the ancient section, whose treasures ISIS had already demolished. Portrait of murdered Khaled al-Asaad at concert in Palmyra ampitheatre. Given the religious basis of terrorism in Palmyra, and Syria as a whole, I am a little put off by the title of this concert “Pray for Palmyra. Music Revives Ancient Ruins.” Sure, “prayer” can have a secular meaning – but to me it brings up pictures of terrorists chanting “Allah Akbar” – “God is great.” This chant seems to accompany the launching of all mortars, rockets and almost every bullet fired by jihadists. Maybe the chant “Allah Akbar” also accompanied each beheading in Palmyra. This video was taken in the Syrian city of Raqqa – the Daesh (ISIS) capital and stronghold in Syria. It portrays the life for ordinary women under the tyranny of these Islamic terrorists. Fortunately, this situation may soon be reversed. Armed forces of Syria and its allies are currently massing to retake the historic city of Palmyra. Battles are also occurring around Deir ez-Zur. The capture of these cities well enable liberation of Raqqa. 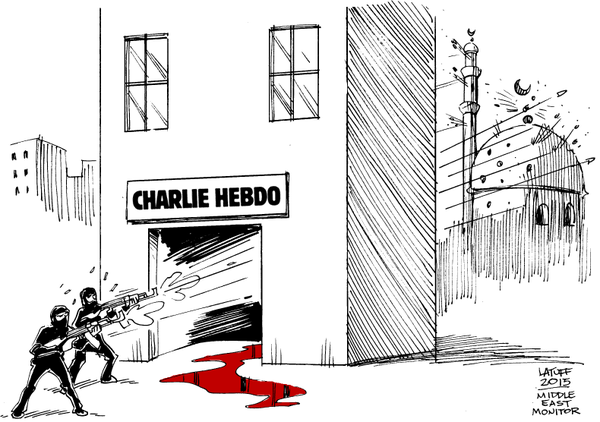 Appropriately, some of the most effective protests against the most recent act of terrorism has come from cartoonists. 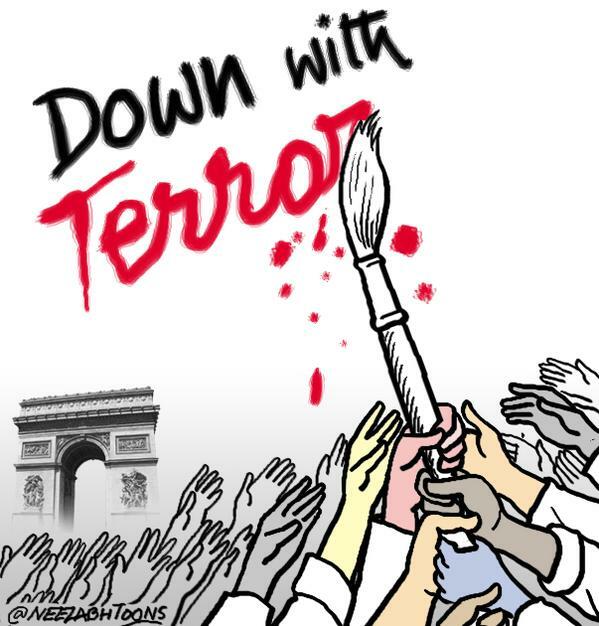 Let’s hope the pencil, and brush, are mightier than the weapons of terror.